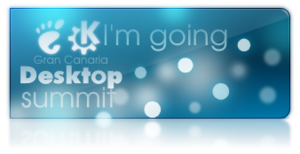 Within three weeks, I will be in Gran Canaria for the Desktop Summit, specifically for Akademy 2009. The summit is also sponsored by Nokia, via Qt Software and Maemo. My talk, Special F/X with Graphics View will be on Tuesday afternoon. There will be some graphics demo which will be shown for time there, so show up if you are interested in. Check also an array of other fabulous presentations.